We told Erin we were going to see Santa at the mall today. “Is it the real Santa, or a pretend Santa?” she asked us. I was still too tired, it being sometime before noon, to muster the energy to commit to a course of fakery and deception that I’d have to remain committed to for what would be years. “It’s a pretend Santa, baby girl,” I drawled from beneath warm covers and dissipating dreams. As I said, my own fatigue decided the issue for us. We weren’t going to participate in the big lie. I was too tired for the big lie. But, I was kind of a fan of the big lie: What is Christmas for non-religious people if not an opportunity to tell folkloric stories about Santa and invest the present with a hint of the magic of the past? I remember this move from when I was a kid and just beginning to question the big lie. My aunt starting dishing out the “Santa’s Helpers” line and that helped stretch the magic out for at least one more year. I think we’ll be able to get a few out of it with Erin, since she’s younger than I was. Awake Shawn appreciated Emily’s appeal to the classic, and the preservation of some of the magic of the season for someone who hasn’t had enough Christmases yet to have a handle on the mythos. Apart from wanting to invest in Erin’s feelings about the holidays, about how magical they are and how important thinking about others is, we have ulterior motives for promoting the big lie for now: We don’t want Erin to be the one who spoils it for her peers. Imagine if you found out some obnoxious three year old had been spouting off, quite convincingly, about the lie, and had persuaded your own three year old that there was no Santa. Or worse, imagine that the three year old got creative, as three year olds do, and assigned Santa a spot in the graveyard because he’d been dead for a long time. That sort of thing is crushing for adults and children alike. A five year old can handle it. A six year old, yes. A three year old? Not yet. So, we went to the mall to visit one of Santa’s Helpers. Last year when we did this Adrian was just starting to crawl and was taking joy in every simple thing. We ended up with a photo that I could only describe as a miracle. This year, despite going to the same mall, seating the kids in the same places, and even seeing the exact same mall Santa, the story turned out a little more…realistic. Yes, realistic is the very word. Merry Christmas from the Burns Family. Well, 3/4 of the Burns Family. Looks like fake Santa's feeling not as happy this year. ROFL Awesome shot. Ditto Sharon's observation. Fake Santa is muttering under his breath, "You have GOT to be shittin' me." The Evil Genius is seven. He'll be eight in January. He still believes, not just in Santa (who comes at Christmas), but in The Holly King (who comes at Yule). It has not been easy to keep the myth alive in TWO traditions, but I've managed so far…mostly by threatening dire consequenses to any adult who threatens to ruin it. So far, none of the kids in our circle have cottoned to the mythos. I dread the day…not because I give a fig about Santa, per se (honestly, I selfishly look forward to the day when I get credit for the best gift under the tree)…but because I love that the magic is still alive for him. Children get hammered by reality at an early age – I am happy to help my son hold on to some vestiges of childhood a little longer. I have always called the Santas we saw in malls, ringing bells, or wherever "The Man Dressed as Santa" and explained that they are representatives of the man himself, prismatic refractions of his elfish presence in the world, and whatever the Evil Genius tells them gets back to the big guy, no worries. The Santa is very well done. He's got a great twinkle considering. We haven't ever taken the boys to Santa's lap. We have no pictures, and but we do send letters. Santa Claus North Pole Canada H0H 0H0 still works. they write letters back too. this cracks me up. ours look pretty much identical (minus the cute girl-child) from the smiling baby in 09 to the freak out that was 2010 right down to the same border design and year. Suffice it to say that i'm judging you both very sternly for propping up this Santa bullcrap with your kids. And, no, it has nothing to do with the fact that i was telling people in fifth grade that Santa was real and my parents had spoken to him just the other night. too long to avoid scarring. The look on fake Santa 2010's face is priceless. Also, it's kind of alarming how much the kids have grown. I know it's been a year, but whoa. We have a few Santa pictures from over the years. My absolute favorite one, is like yours from this year. One kids smiling all big, the other screaming bloody murder. You must have used up all your Christmas miracles on last years photo. That one is amazing. Notice the difference in how Santa looks in those photos? It's subtle, but there's some kind of evil lurking in his eyes. That's the kind of Santa I can believe in. I also believe I'd keep that 2010 photo up all year long because it is totally divine. It's the gift that will keep on giving until Adrian gets married. 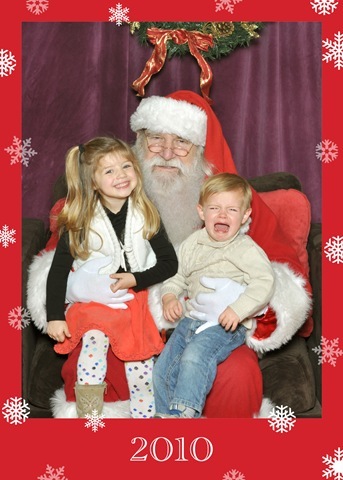 My son didn't even attempt to bring his daughter to see Santa this year. She hides her face in his shoulder when he visits relatives at the holiday…..so I suspect they knew that Santa was OUT.